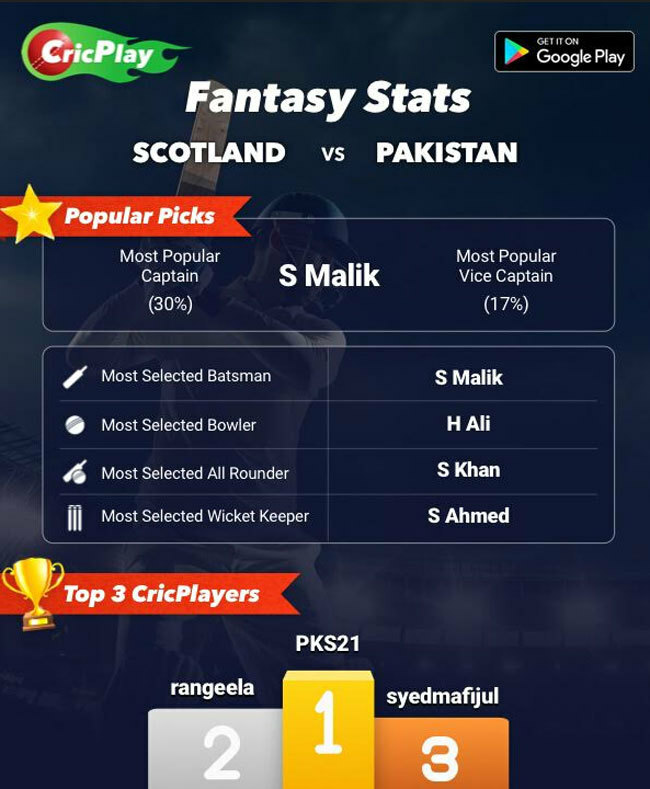 EDINBURGH: Shoaib Malik blasted a quick-fire 49 as Pakistan powered to an 84-run rout of Scotland in the second Twenty20 international on Wednesday. Malik’s unbeaten innings took just 22 balls and containing five sixes and one four, setting the stage for Pakistan to seal a 2-0 series win. Fakhar Zaman (33) and Ahmed Shehzad (24) rattled up a 60-run partnership for the first wicket in Edinburgh before Scotland hit back to reduce the tourists to 98-5. Following on from Sunday’s historic win over England — the world’s top ranked one-day international side — Scotland were hoping to claim another big scalp against the number-one ranked T20 nation. Michael Leask’s three wickets gave Scotland hope, but Shoaib’s brutal hitting kept Pakistan in charge as his side reached 166-6 after their 20 overs. Scotland had scored 156 in a losing effort in the first T20 clash with Pakistan on Tuesday, but this time they were unable to muster a decent response. George Munsey was caught for a duck after just two balls and Pakistan made short work of the rest as the Scots finished 82 all out after just 15 overs. Faheem Ashraf took three wickets and Usman Khan claimed two in a commanding display from the Pakistan bowling attack.